Work on the Royal Canal Way (Royal Canal Greenway) is completed in Westmeath and well advanced in Dublin and Longford. When completed (which is envisaged for 2019) and will offer a first-class multi-purpose off-road walking and cycling link from the river Liffey in Dublin, through Counties Dublin, Kildare, Meath, Westmeath and Longford to Cloondara on the River Shannon. 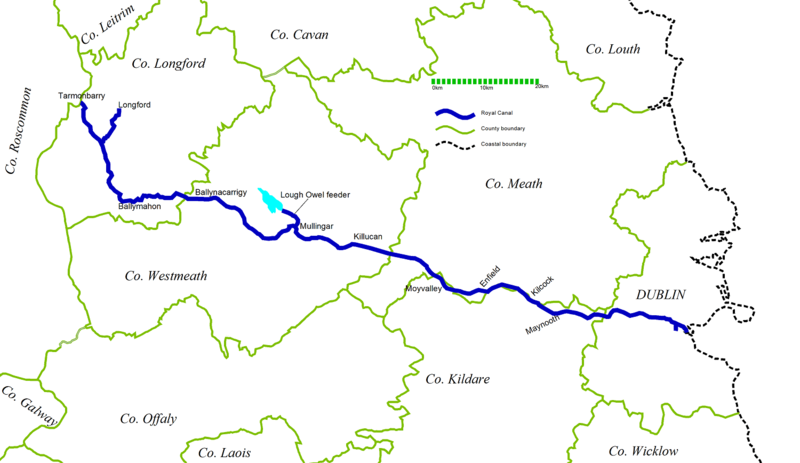 Two spur lines, one from Mullingar to Loch Owel, and the other running from south of Killashee to the town of Longford, are also part of the Royal Canal Way. See Longford to Cloondara and for Westmeath see Interactive Map. And for Royal Canal amenities and activities see; Walking/Cycling, Boating, Fishing, Distance Tables and instructions for the use of ‘Royal Canal Smart Tags’. to 12th at Castleknock; 2.5 km. Cross Guns Bridge, Phibsborough to Broom Bridge, Cabra; 2.25 Km. Work to commence in September 2018 (March 2018). Broom Bridge to Ashtown; 2.25 Km. Upgrade in the planning stage, with work expected to start early 2019 (March 2018). Confey to east side of Maynooth Harbour; 8 Km. Work on this section has started (March. 2019). Cloncurry Bridge to Westmeath Border; 22 Km. Towpath is closed with work ongoing which is expected to be completed end of 2018. (October 2018). 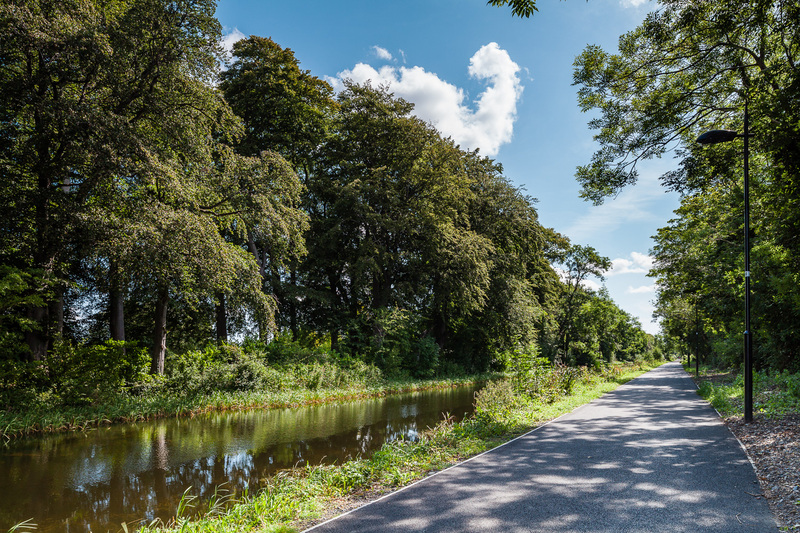 Ninety kilometres of the Royal Canal Way, running from Dublin city through Fingal, Kildare, Meath and Westmeath to Mullingar will form part of the proposed Dublin to Galway East-West Link. 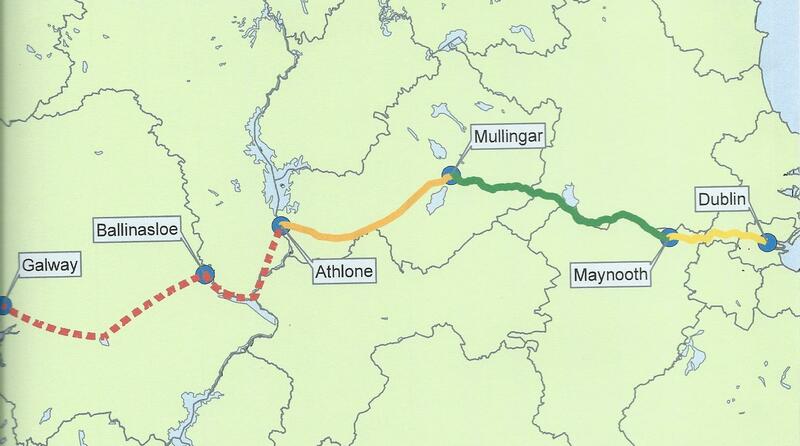 Mullingar to Athlone: Just west of Mullingar the Royal Canal Way joins the East-West Link. This 40 Km walking and cycling route runs along a disused rail line to Athlone, where it was planned to cross the Shannon into Counties Roscommon and Galway. The Westmeath section was officially opened in Moate on Sunday 18th October 2015. See Irish Independent (11 October 15). Athlone to Galway: This section, through Counties Roscommon and Galway was planned to be completed in 2019 and would have provided an off-road walking / cycling route from Athlone to Galway city (140 km). However, due to unresolved concerns by landowners along the proposed route this project was shelved in October 2015. See; Galway Independent (30 Oct. 2015). The planed Dublin to Galway east West Link also forms part of a Pan-European walking and cycling route, the EuroVelo 2 Capitals Route linking Galway to Moscow. However, at this stage it looks like it will run from Athlone to Dublin. Then having crossed the Irish Sea to North Wales it will wind its way south to Bristol. From Bristol the route will run via London to Harwich from where it will cross the North Sea to Holland. In Europe, the EuroVelo will run from The Hague through Holland Germany, Poland, Belarus and Russia to Moscow. Euro Velo Rout 2 is one of fifteen walking and cycling routes that span Europe, two of which run through Ireland. The other, the Wild Atlantic Way forms part of EuroVelo Route 1 which runs along the Atlantic Coast from Norway through Ireland to Portugal.